In order for students to succeed in the digital world, they must understand the purpose of different types of media. One media type that is increasing in popularity is the infographic. Infographics are visual representations of information that use icons and pictures to express the meaning of data. You’ve seen them used in blog posts and shared on social media. The ASCD has an entire Pinterest page devoted to examples of infographics on educational data. In Social Studies classrooms, students can create infographics to express their understanding of a concept. The combination of images and data is powerful. Telling the story behind a set of numbers and making it meaningful to a reader is a digital skill that your students can explore. Where can students find data for their infographic? Data for infographics can be collected by students through surveys or found on a variety of databases. The type of assignment you’ve outlined for students will determine where they can find the appropriate data. Students might gather data from a textbook or primary source document to locate numbers. This could include information on troop movement during a battle, consumption of natural resources over a period of time or immigration trends. There are also online databases full of data. One government database worth checking out is data.gov. It includes data on education, health, public safety and more. How can students create an infographic? 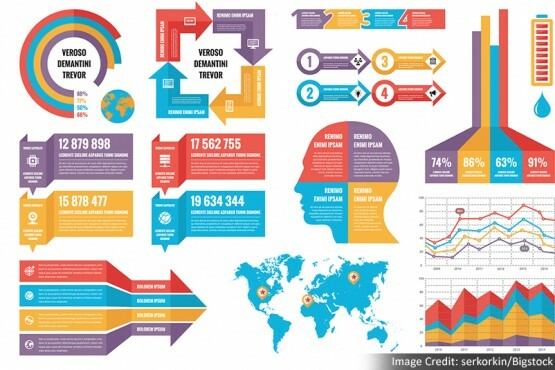 There are a handful of tools that students can use to create infographics, including poster making apps like PicCollage and Pages, as well as websites like Piktochart and Canva that let students create infographics on any web browser including Chromebooks. Students can use any of these tools to make an infographic that combines images, icons, text and numbers. They can weigh the impact of color and images in setting the tone for the topic and grabbing the reader’s attention. Infographics are authentic products that students are familiar with seeing in their everyday lives. These shareable finished pieces are perfect for class blogs, bulletin board displays or exposure on school social media platforms. Incorporating this type of assignment into the work that you do will help students understand a topic while connecting to the real world.